Sophie was really stressed out Friday night over a birthday party she had been invited to. She did not want to miss practice the night before a meet. She is very ritualistic in her approach to life, especially when it comes to swimming. She likes the Friday night practice, they do meet warm-up, practice the strokes they are swimming for the meet and work on starts and turns. It’s a great quality of hers but it is also important to remember she is ten. We worked it out that after practice she would stop by the party for pizza and cake and she would have about an hour to catch up with her friends. We packed up and were heading to the pool. She had her beautifully wrapped gift to one side of her feet. Her swim bag to the other. As we were about to make a right turn into the pool complex she looked at me and said “I guess it wouldn’t have mattered if I had skipped”. She wasn’t quiet on the way to the pool. Didn’t appear to be in deep thought. I am quite sure this thought popped randomly into her head as we were approaching the pool. Without saying a thing I turned left and simply said “go to the party”. She never second guessed the decision. With day one of the meet behind her we can safely say nothing bad happened because she missed a practice. At the meet (IMX) the kids have to swim all five events (and they must have a time in the events) and they receive an overall ranking at the completion of the meet. She was entered as a NT in her 100 breast, she just swam it last week so it didn’t “officially” transfer to the psyche sheet. I thrilled because breast stroke is her least favorite stroke and it was last yesterday, meaning we would get to leave very quickly because she was in the first heat. What I didn’t count on was that she was also seeded 13th in fly, putting her in the second to last heat of fly. She swam her fly, and dropped time. She got out as the last race of fly started, stepped to the left smiled and a minute later hopped on the next block over to swim 100 breast. It wasn’t a best time but I didn’t expect it would be. She laughed about it all the way home. It was a huge win though. A year ago the very notion of this would have put her into a tail spin. Missing practice before a meet wouldn’t have been an option. Sophie has really matured through the sport of swimming and is becoming more adaptable to things outside her comfort zone. I’m proud of her! She is back at the meet and her smile has faded somewhat. She is missing the kick-off to the Super Bowl. Who came up with today as a good day for a swim meet? Sophie has always liked a schedule. Even more so, she doesn’t like it when her schedule is thrown off. I have learned over the years that I need to give her adequate notice when things are different than she expects. When she was five, Sarah and Grace were swimming with a small team that also had a lesson program. I put Sophie in lessons once a week to prepare her for summer swim. Her lesson were in the well and Alec was her coach. One day Alec was out and his buddy Jorge took over for him. Sophie refused to get in the pool – Alec was her coach. Not Jorge. She knew Jorge, liked him, and thought he was a perfectly fine swim coach. He just wasn’t her coach. No less than ten people tried to coax her in the pool. Me? I knew better. It wasn’t happening. Fast forward five years years not much had changed. Sophie is comfortable on her team, knows all of the coaches and is fine with any of them coaching her. She also knows what lane she is in, who is in front of her, who is behind her, what the interval is, what day the need fins, the exact hour in which she is eligible to move up to the next group and exactly how many ice cubes she needs in her Gatorade. I like to run a tight ship but sometimes she exhausts me. Sophie practices four times a week – her group offer s five with a minimum of three. She goes to four. Every week. The same four. Tuesday through Friday. But not Sunday. Because it is too early. And it’s never been negotiable. She skips on the rare occasion. Like last Friday. She has a sleepover birthday party to go to. Missing one practice won’t kill you…right? I’m not really sure what to do with this. I’m a firm believer that practice is important. But after seeing the struggles Grace went through after committing to too much practice too early on I also think life is short, enjoy being a kid while you can. Sophie sees the meet as big one. It’s the IMX meet and she is seeded pretty well. She is also ten. I admire her commitment to practice and I also understand her need to adhere to “her” schedule. She is honestly happier when she does things according to plan. I’ll let the final decision be hers. Soon enough she will be changing groups and going from the fastest lane to the slowest. She only has two more meets as a ten year old – IMX and JO’s. She will do well at both and as much as I know this isn’t the moment she will remember in swimming I also have to remember that to her, right now, it is. Whatever choice she makes, it will be the right one. I need to let her enjoy her being in the fast lane. It doesn’t last forever. And lucky for me, she gets that. The life of a swim mom is crazy. Having three girls that swim adds to the madness. This year we have added another layer (or two) to the insanity – Grace not only swims for a different club than Sarah and Sophie, but she also is swimming for her high school swim team. It’s been a season full of meets, at least one every weekend for the last several months. Sarah had a travel meet in Delaware and Grace had a meet in Baltimore. These are the first meets outside of PVS meets that I have attended besides zones. The high school meets are also completely different than what I am used to. PVS (Potomac Valley Swim) is notorious for having fast swimmers and well run meets. It’s nice to have great meets, whether it is in your home pools or in your neighbors backyard. The furthest we travel for meets is 45 minutes to the University of Maryland. It’s been really easy for us up until now and we have always had great competition at our meets. The downside is we swim against the same kids, month after month, year after year. I could probably hand write the psych sheet for our meets. It’s that predictable. Our high school is in a relatively new area – the school is only ten years old and our team is still relatively small, especially by Montgomery County standards. We only have about thirty kids and only a handful of year round swimmers. We moved up to Division III last year. It’s been really fun for Grace – she has gone undefeated and set an individual school record and has helped break the record on two relays. It’s been fun watching her swim in a less competitive environment. I haven’t seen her smile and laugh that much since she was 9! The meets are also short and sweet, what’s not to love? It’s also fun seeing kids experience swimming for the first time or swimming their first 100 or even 500 free. It’s more about the sense of accomplishment. Because our high schools don’t have pools, we end up having meets at pools throughout the county. Many of the pools don’t even have spectator seating. They certainly don’t have touch pads or heat sheets. Race results are written on a card with handwritten swimmers names. It’s pretty low budget. No one seems to mind. I compare that to the USA-S meets we have attended outside our LSC. One was quite honestly the longest and slowest meet I have ever attended. The other was a mid season trials/finals meet – not a lot of best times but a great opportunity to race finals outside of a championship meet. What really surprised me was how much the parents from our team complained at one of the meets. It was a slow meet, the sessions were way too long, the seating was awful and there were no concessions. Oh and wait…we had to pay to get in. Five whole dollars. It was Sarah’s first travel meet and the group of us that travelled together had an absolute blast. Sarah made some incredible memories with her friends and despite not getting many best times, left the meet loving swimming even more than she did when the meet started. I had a great time road tripping with friends and having wine and pizza in the hotel lobby. I guess what I noticed the most is that so much of these meets is about perspective. Swimming isn’t the most exciting sport to spectate – and it certainly isn’t the most pleasant place to sit for hours on end. But if you decide you are miserable you will be. Our children follow our lead, some of the kids had a great time at the travel meet. Others were miserable. If nothing else comes out of it, I really hope they gain some perspective as to how lucky we really are that by and large, the grass is never greener. More importantly, as parents we need to remember these meets aren’t about us. A few times a year the kids have to miss school for swim meets, some are three and four days long, especially the big championship meets. Up until recently we have been pretty honest but lately it has backfired. I got lucky this weekend, in so much as two of my kids were extremely ill. Fevers and vomit stop most people dead in their tracks and the questions are minimal. I very much would have preferred lying, illness during a swim meet, especially a big one is no fun. There are times when I have been honest. There have been times were I have danced around the truth (college visit or out of town obligation). And I have lied. For those times were I simply need to spring them early appointment has always worked. I’m sure to schedule all Doctors appointments after school so I can save those up for swim meets. The last few times though I feel like I have gotten the evil eye. It happens 3-4 times a year at most. Our high school gave a few parents trouble today and said a swim meet was not an excused absence. While their peers were sitting in Spanish or study hall, those kids were getting Junior Nationals cuts. And failing exams because they weren’t allowed to take them. They had informed their teachers in advance they would be out and had tried to make the work up before missing school and the teachers said to wait. As far as I know none of the teachers actually cared, it was the attendance office. I hate lying – especially when it comes to my kids but I’m starting to find it necessary. I would love to hear your thoughts. I know there are people who refuse to take their kids out of school for meets. Some who lie. Some tell the truth. Some schools are supportive and some not. So what works for you? What doesn’t? What is your threshold for telling the truth? It couldn’t end soon enough. This past weekend was sure to be crazy. NCAP hosts the Tom Dolan Invitational, a very fast qualifying meet that brings people in from all over the country. This would be Grace’s second weekend at University of Maryland, a solid one hour drive from our house. Having just spent the entire previous weekend there, I let Chris have this one. RMSC hosts their own qualifying meet, The Holiday Invitational. This is a much smaller qualifying meet but quite fast as well. The upside of this meet is that many of the kids end up making finals, something that is all but impossible at TDI. The downside also happens to be that many of the kids make finals. Sophie was seeded such that she had a shot at finals in all 6 of her events. Sarah, having just aged up would likely make finals in two events. This meet was a fifteen minute commute from the house. I was committed to getting the kids back and forth to this meeting, knowing it would be some long days. In the end, it is important to note that I PICKED this meet as my responsibility. Holiday Invitational started Friday. Sarah had a ride to warm ups so I could get Grace off to school and take a quick shower before spending 12 plus hours at the pool. I had just finished drying off when I got a phone call from Sarah. I could not understand a word she was saying but knew it had something to do with come get me. And now. At the same time I was getting texts from coaches, Sarah is not well. I raced to the pool and picked her up. She curled up in a ball, shivering in the passenger seat. By 9:30 she had been diagnosed with the flu and was loaded up with drugs. Great. I got her situated at home with fluids and took Sophie to her session. She swam 50 fly and 200 IM, making finals in both. Her fly was fantastic, IM a little rough. Same held true in finals. Sarah was curious what Saturday would hold. I told her we would wake up Saturday and decided. I was not holding my breath (all the while, holding my breath anytime I was near her and scrubbing down after leaving her room). I woke her up Saturday. Well tried. She did not swim. At this point she had missed all of her best events. Sophie was swimming 200 fly and 2oo free. If you are wondering who puts their ten year old in 200 fly and 200 free on the same day, yes you are correct, I am an idiot. Never mind that she had swam 50 fly and 200 IM twice the day before. Both her swims were bad enough to earn her a night away from the pool. Which was great because when she came upstairs she looked like she had been hit by a truck. She put herself in bed at 6:30. Meanwhile, Sarah had been resurrected from the dead and was begging for Chipotle. By Sunday Sarah was back to her usual self. She swam one event, did pretty good for a kid coming off the flu and most importantly picked up her bag tag and t-shirt. In other words, she came, she saw, she picked up her swag. At this point Sophie was looking pretty rough. I give her credit, she decided not to get the flu that Sarah had but some completely different virus, complete with a persistent cough and inability to breathe. But she wanted to swim. Kids were dropping like flies from the meet, everyone was sick, yet I made the decision to take her, she wanted to swim. Again, she did not look good in the pool. She also didn’t swim slow enough though and made finals in 100 fly. I took her home, fed her and drugged her up. After warm ups, she disappeared. I’m pretty sure she was curled up in a ball under the bleachers sleeping on a bed of crumbled up nachos and sticky Gatorade spills. At this point, mommy guilt crept in. I couldn’t help but think “what kind of person brings a sick ten year old to finals”. I was absolutely convinced I should have scratched her. Now, before you get all excited thinking she swam her little heart out, let me stop you. She didn’t. It was sad, pathetic and awful. She came upstairs, dark circles around her eyes, exhausted and smiling. I had to ask “what did your coach say”? All of my self doubt went away. Until we walked in the door and she went straight to the bathroom and puked her guts out. I’m either mother of the year or the worst mother ever. But there are absolutely no words to describe how happy I am that this weekend is over. I would love to tell you how Grace did but she wisely stayed so far away from us. I’m not even sure she still lives here. Grace swam this past weekend at the University of Maryland pool. It is her first trials and finals meet as a newly minted 15 and up. She has three qualifying times for the Tom Dolan Invitational next weekend – Turkey Claus is considered the companion meet for TDI, they can’t swim any events at TC that they have a TDI qualifying time in. It’s almost impossible to make finals at TDI, kids come from all over the country to compete in this meet. It is often described as the fastest age group meet in the country. When you look at the top seeds and where they are coming from it is clear to see people who come to this meet mean business. The kids who swim TC though are hopeful they will make finals. Grace was slightly optimistic. Sort of. Truth be told, we didn’t plan to be there for finals. She swam 500 free and was .17 off her seed time. She wasn’t happy with the swim. On the way home she apologized to me – she said she felt as though she were wasting all of my time and money. I asked her if she was happy swimming. She said she was and I assured her that I was too. I also realized that “she is happy” really just means “we are coping”. Friday she swam 200 free and it was ugly. Her 100 fly was okay. I was timing and she actually came and talked to me.. this is a new development. She even let me hug her and kiss her on the head. It was a blessing she didn’t make finals. We were tired and she was developing a nice cough and head cold. Saturday she didn’t swim the meet – she had a high school meet and she had the qualifying times two of the events so breaststroke was the only option an easy pass. She swam her high school meet, got first in her races with a half hearted attempted and a very congested head. By Saturday night she was exhausted. For the first time ever, we contemplated skipping the Sunday sessions in favor of getting some rest. Warm ups were at 6 AM and we had an hour commute to the pool. Rather than decide Saturday night, we went to bed early, setting the alarms and got some much needed sleep. In the end, she opted to go to the meet. She swam 200 IM (right at her seed) and 100 free (off by about half a second). She was seeded 22nd for finals in 100 free and we were confident we had the evening off. I took Grace to lunch and since the meet was officially over and she decided to splurge and have a huge plate of nachos, complete with guacamole and sour cream. During our conversation she mentioned that the pool – University of Maryland – was known for being a fast pool and that everyone seems to get best times at the pool. Except her. I had already noticed that, at the meet in the summer. Sarah had the worst meet of her life there and Sophie just did ok at the pool. It’s a big stage, the biggest they swim in. My kids don’t get intimidated or nervous swimming in big events, this pool just seemed cursed. As Grace was polishing off her final chip we received a message from her coach. Grace had made finals in 100 free, clearly many kids had decided to take their best times and call it a day. I won’t lie, we both made the “really?” face. And then I took her home for a nap. You may have already guessed where this very long tale goes but after four days of mediocre swimming, a terrible cold, a strong desire for this meet to just end, a pile of laundry, a house not decorated for the holidays and one of the worst meals ever before finals Grace went back to that pool and dropped time in 100 free for the first time in a YEAR. She dropped .23 which at her age and speed is monumental. Grace went to bed last night tired, sick and the happiest I have seen her in a long time. “We are happy” now has new meaning. It means “we are ready”. If it takes another year we are ready. It’s a rough age group. It’s all about hope. Yes, you. The one playing words with friends on your phone. Did you notice it just got really quiet in here? That is because the meet just stopped. No one puked in the pool. A DQ isn’t being debated. They aren’t even fixing the touch pad. Those of us on deck aren’t looking for some random person in the spectator seating area. We are looking for you. They have stopped the meet because you are too self important to come down and help us time. At yesterday’s meet the boys and girls sessions were both stopped due to lack of timers. The kids who were warmed up and ready to swim sat on the cold pool deck. We stood on our tired feet. Out other kids got picked up from school by friends and neighbors. Thirty minutes passed. You may have even started a new game or played a 100 point word. I try hard not to judge other people but I don’t even try to stop myself from judging people who refuse to come help out. By the time we got to 400 IM I timed lane 1, was head timer and results runner. It’s sad that people aren’t willing to come help out. A few months ago one of my kids asked me if I timed at all the meets “to look good”. I can’t help but chuckle, I roll out of bed for swim meets, cute I am not but I don’t think that is what she meant. At the time I answered her honestly, I time because it’s the right thing to do. The truth is, I time because that is where all the normal people hang out. See you on deck. I’m head timer today at our high school meet! When the girls were young I hated it when people would say “they grow up quick”. When you have a 1, 3 and a 5 year old you almost hope they are right. And then a decade passes. In the blink of an eye. Sarah became a teenager yesterday. I’m still alive today so having two teenagers in the house can’t be that bad. So far, so good. Speaking of good, Sarah can look back on the past year and GOOD would be a ridiculous understatement. She had a phenomenal year. Even that might be an understatement. She went from being a solid, middle of the road swimmer to one with a AAAA cut in one year. She worked hard. It was well deserved. But even more importantly, she wanted it. Sarah is unique. She believes she is going to win. At everything. She is highly competitive and has more drive than anyone I have ever met. In the last year she has also matured and grown in confidence as a result of her swimming. She doesn’t always succeed but she gives every race her all. She learns a lot from the failures. She can be strong headed but I wouldn’t change her for the world. She is a poster child for every 12 year old who doesn’t think they measure up. She took every small victory as a success, practiced hard and completely believed in herself. The hard work always pays off in the end. I’m not worried about having two teenagers in the house. But I do know that as Sarah gets older, dropping time will get harder. I don’t worry about her though, she has enough fire in her to get through it. I’m very proud of her. Happy Birthday Sarah. Welcome to 13-14. I’m on the 6 month countdown to saying good bye to 9-10 forever. I won’t lie, I won’t miss that one bit. Too much drama. This weekend is the redemption meet. Both Sarah and Sophie were looking to settle a few scores. They had both fallen short on personal goals at the last meet and both went to their coaches asking to change meet entries trying to settle the score. Both were granted permission. Sophie had problems keeping her goggles on and dropped then on her dive at a big meet last month. She was devastated and wanted a chance to redeem herself. She swam it without any real completion last night, dropped time and got the AAA cut. She also swam a really impressive backstroke. I think she has a stroke that can rival her fly. Today she swam 200 fly with the 11-12’s. She only had a long course time in it and wanted the short course JO cut. She crushed it, along with many twelve year olds. Not too shabby for a 10 year old! I know you are dying to know…yes, her goggles stayed put. She had them secure under her cap!! Baby is coming back tonight for 100 back and 50 fly and I’m optimistic she will do well. Sarah had her eye on one prize. Before aging up she wanted to get the AAAA cut in 50 breast. This was her last chance to swim it. She had to negotiate with her coaches, she swam 400 IM yesterday. She did a great job in it. She had debated wearing her kneeskin for the 50 breast but in the end decided to wear her regular competition suit. She rarely speaks to me at meets, usually just for money. She called me before her race and said “I’m nervous”. I didn’t have the heart to tell her I was nervous too. She is a confident swimmer. Sarah always believes she is going to win. I love her drive. I knew the moment she got on the block that she was going to do it. And she did. She took off .66 and got the time by .33!!! She won the heat by a full 2 secondsI. I was so happy for her. She ages up next week and will never swim the race again. What a great way to leave 11-12 behind. Watch out 13-14 here she comes. I am really happy for her. All that, in a really slow pool, no one to race, and no fancy kneeskin. Sometimes just wanting it really bad is enough!!! I’m a proud momma. I absolutely love SwimSwam. I follow them on facebook and I’m constantly sharing their articles or they are being shared with me. My all time favorite swim mom sent this one to me this morning and I thought it was just spot on. My kids love reading SwimSwam and are particularly excited when an article is posted about a friend, or about a meet they were at. It’s really a great site, filled with lots of inspiration. If you haven’t checked them out you are definitely missing out. 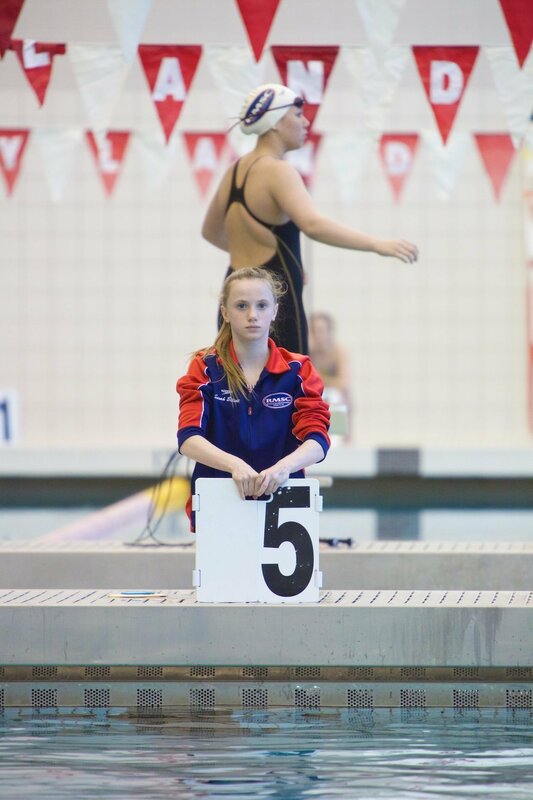 Sarah’s claim to fame – her photo was featured during our 14&U JO Champs!